African American soldiers carry a Japanese prisoner from stockade to be evacuated and treated for malnutrition. At Iwo Jima, the segregated 8th Marine Ammunition Company and the 33d, 34th, and 36th Marine Depot Companies served as part of the shore party of the V Amphibious Corps. Elements of the ammunition company and the 36th Depot Company landed on D-Day, February 19, 1945, and within three days all the units were ashore, braving Japanese fire as they struggled in the volcanic sand to unload and stockpile ammunition and other supplies, and move the car go inland. 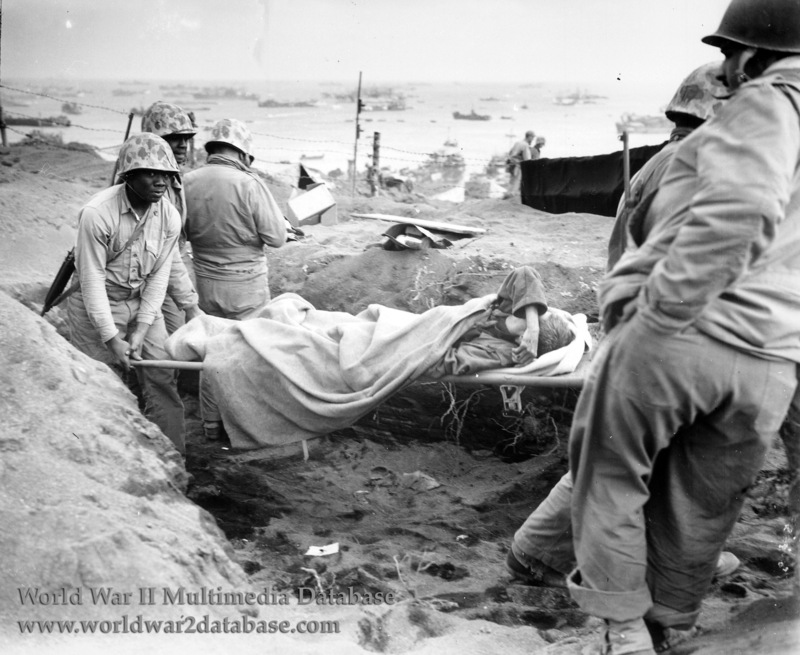 Eleven black enlisted Marines and one of the white officers were wounded, two of the enlisted men fatally. The African American companies that fought at Iwo Jima shared in the Navy Unit Citation awarded the support units of V Amphibious Corps.